In English class we were asked to write about who inspires me and why, so cool! Here’s the how and why from me. I’m going to tell you about the person who inspires me, Davey du Plessis. You might say, “hey that’s not a famous name, like a swimmer, actor or pop star, but that’s because he is new on the scene, having just written his first book, called ‘Choosing to Live’. 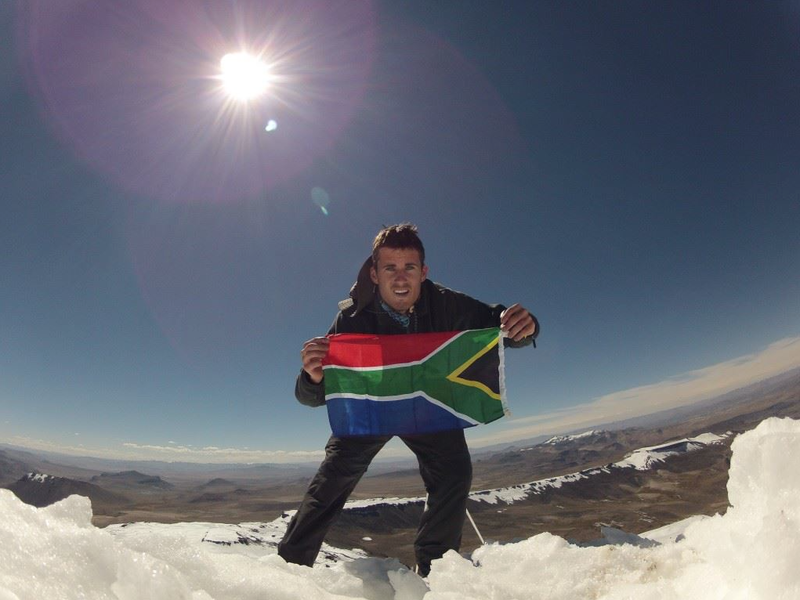 Davey has sure got a story to tell, being a South African adventurer! This is the man who chose to go to the Amazon Jungle, all by himself, to mountain climb from the start of the Amazon River and kayak along it to where it ends at the sea. His trip was supposed to take about 4 months but about 2 months into it, while on the river, he got shot and the attackers were ready to finish him off. I’ll read a paragraph from his book, once he was shot 3 times already, and comes face to face with one of the attackers…. I think though, I have left the best part for last. 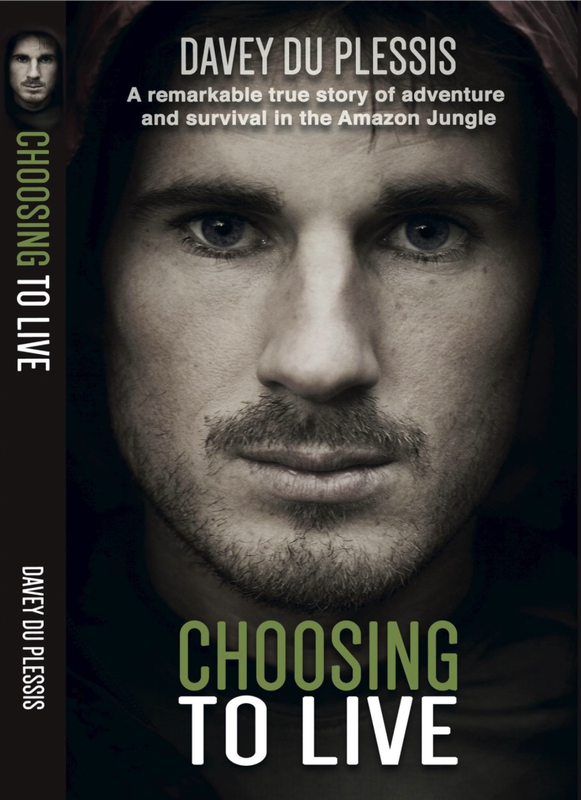 This brave man, Davey du Plessis, who chose to live not die, is vegan. Yes, he inspires me because he gives animals the same choice. To live, not die! 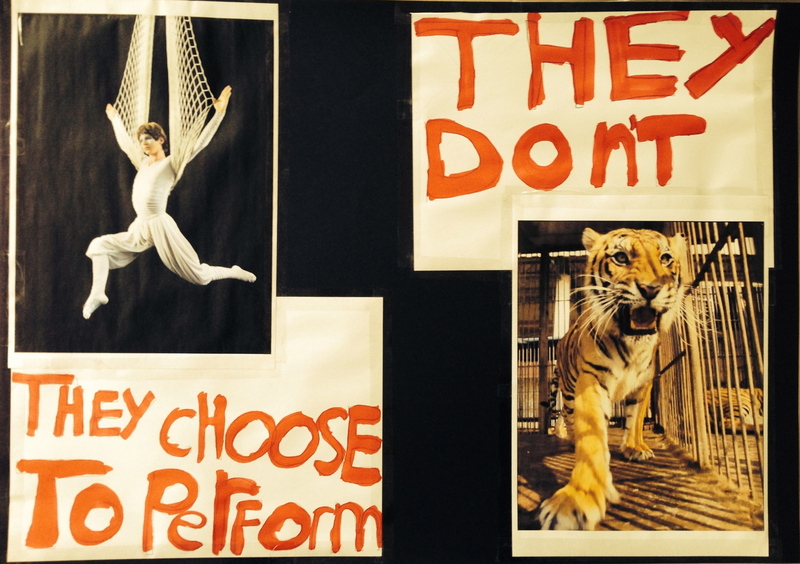 Animal circuses – fun or frightening? We all love animals, right? That’s why we go to circuses, to see these amazing animals do awesome tricks! If only we were all flies on the wall. This way we would get to see behind the scenes. These captive wild animals are forced to practise uncomfortable and often painful acts. There are whips, scary noises, water and brooms used as threats of punishment if they do not perform what is expected of them. Through the animals eyes you would see these tricks as confusing and forced. These lovely animals need someone to speak up for them. So we joined a group of people in protest. 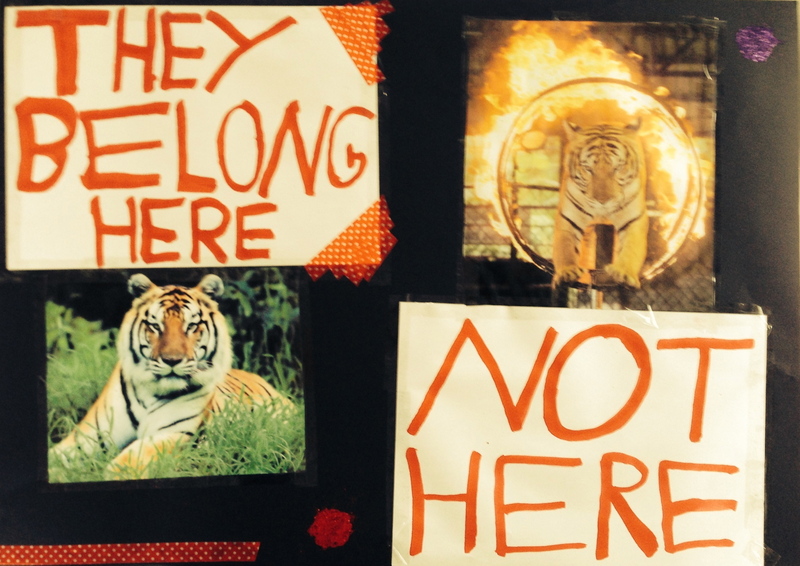 Although a silent demonstration, our banners were loud and clear. My family and I were there on all three days of the protest and on every day more and more kids joined us. I was happy to see that children were getting involved. Sadly though, there were also lots a parents taking their kids to the circus. I also noticed that the parents were avoiding looking our way, yet their children look very interested in what we were saying. My wish is that more parents will be open to these messages and teach their children FULL animal love! Here’s two very short video’s where I’m NOT silent! This one and this one! I’ve always felt such sadness for the dogs on the streets. Especially in Qatar, my old home, and Turkey, on a recent holiday. When I moved to Knysna, (Western Cape South Africa), I hadn’t seen dogs on the street, so I thought life for dogs was a lot better here. Then we got an email from our local animal welfare society asking us to attend a dog fighting protest. First I felt a bit like protesting might be an aggressive action, but I was torn because I wanted to do something for these dogs. I distracted myself by making a great big, meaningful poster. Mom assured us that there was two types of protests, a badly-vibed one and a peaceful one. 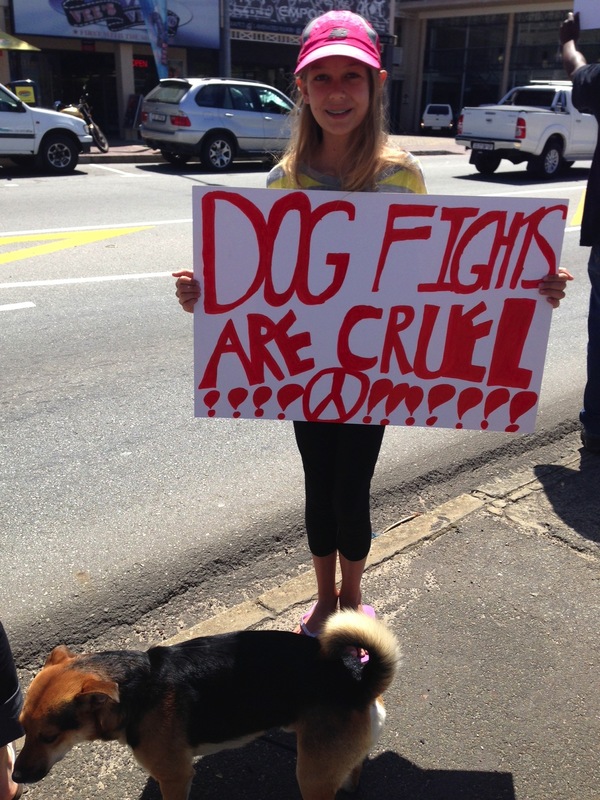 Our friend Elaine who works with Knysna Animal Welfare Society (KAWS) is such a big-hearted person that I knew this would be a friendly protest. On the first morning of the protest there was a big crowd and our national television cameras were there. I felt lively and united with all the other caring, like-minded people. In my soul it felt like I was doing just what was right for me! Unfortunately the trial was postponed until the next day, and while we all came back the TV crew didn’t as Nelson Mandela sadly passed away the night before. Here’s a video (caution – graphic content!) on this particular dog fighting group of people who call themselves ‘DOGMEN’. I think it’s horrifying how these humans can just stand there and watch dogs kill each other. I couldn’t believe that these cruel people are actually professionals and maybe even fathers! In 2014 I hope to participate in more activities that bring awareness to animal welfare and really protect these kind and loving animals. I know some vegans eat honey but I just don’t. I just would rather eat sweet, sticky syrup. I felt uncertain about going to a bee farm. At first I thought I wouldn’t go. Then I though why not, I could find out a bit about how they treat the bees and share it with you guys on my blog. 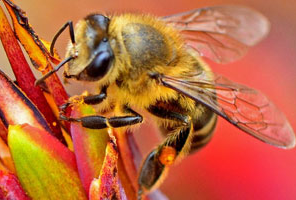 Through my Mom’s vegan friends we found 10 questions that would help me get an idea of what’s going on at a bee farm. Here are the questions and answers. Me: When do you harvest the honey? Her: When the bees have enough and the hive is overflowing, during summer, spring and autumn. Me: What replacement food do the bees get over harvesting times? Her: Fynbos. Me: Do your bees get moved to fields for pollination? Her: No! We would never do that it makes them very sick. Me: How do you protect and care for your bees? Her: We rescue them from domestic homes and other places they could threaten people and put them into a safer environment. Me: How many bees do you lose each season? Her: They all die each season. Me: Why do they die? Her: They work until their wings can’t work anymore and they are so tired and worn out. Me: What is the bees lifespan? Her: In summer they live up to 28 days and in winter they live up to as long as 3 months. Me: What happens to the queen bees? Her: They leave the hive once she has had a lot of babies. Me: How will this bee farm help to look after the local bee pollution? Her: Schools coming here to learn how important they (bees) are brings awareness to their importance. I’m glad I went because I learnt a lot and got a feel for what happens on this small-scale bee farm. I still feel assured that I will not eat honey and will stick with the sweet, sticky syrup. This type of bee keeping farm would perhaps suit vegans who still choose to eat honey.